canoe in the Liffey Odyssey on Sunday 29th of April. 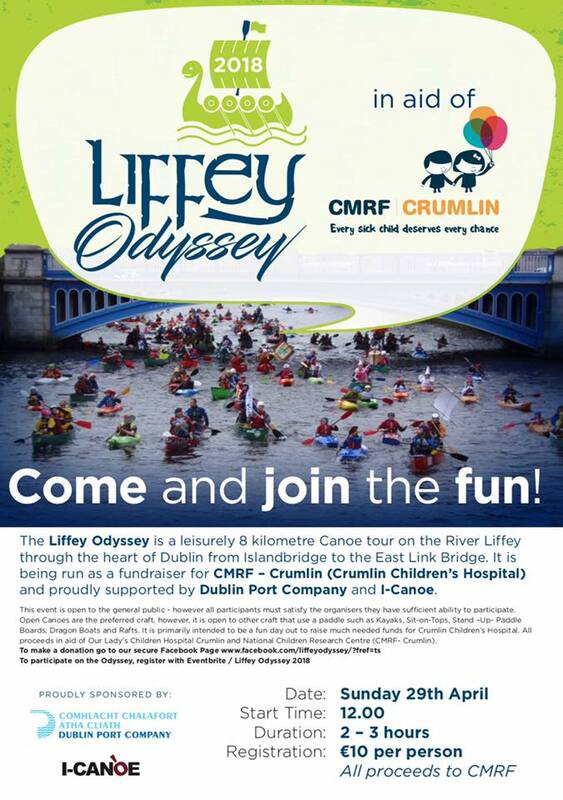 The Liffey Odyssey is an opportunity to promote your business, build teamwork and help raise much needed funds for Crumlin Children’s Hospital while joining the fun in a unique canoeing experience on the River Liffey through the heart of Dublin. There are opportunities to promote your business at the start, the finish and of course from the Liffey as you paddle along the route. 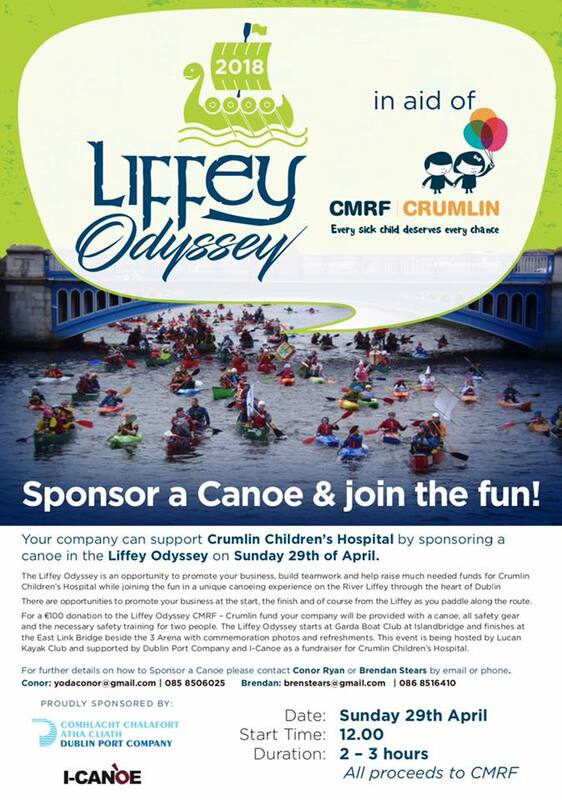 For a €100 donation to the Liffey Odyssey CMRF – Crumlin fund your company will be provided with a canoe, all safety gear and the necessary safety training for two people. The Liffey Odyssey starts at Garda Boat Club at Islandbridge and finishes at the East Link Bridge beside the 3 Arena with commemoration photos and refreshments. This event is being hosted by Lucan Kayak Club and supported by Dublin Port Company and I-Canoe as a fundraiser for Crumlin Children’s Hospital. For further details on how to Sponsor a Canoe, please contact Conor Ryan or Brendan Stears by email or phone. Ahead of the Easter holiday period, and as part of Invasive Species Week, Minister for Culture, Heritage and the Gaelacht Josepha Madigan TD today (Tuesday 27 March) highlighted the importance of water amenity users (such as anglers, canoeists, and walkers) following the ‘Check Clean Dry’ protocol. The Minister was speaking in advance of a National Parks & Wildlife Service (NPWS), Canoeing Ireland and Wild Water Kayak Club hosted, and Waterways Ireland supported, canoe-wash at Islandbridge, Dublin to illustrate the practical application of the measures. ‘Check Clean Dry’ is a vital biosecurity initiative that is aimed at helping stop the spread of non-native invasive freshwater plants and animals, as water users may unknowingly be helping to spread invasive species from one water body to another in equipment, shoes and clothing. · Dry all equipment and clothing. “I am delighted that today’s event highlights the co-ordination and co-operation between water sports enthusiasts and Government Departments and agencies that is the cornerstone of effective biosecurity measures. It is essential that initiatives such as ‘Check Clean Dry’ are followed so as to ensure that our wonderful natural amenities available nationwide remain accessible and useable to those who wish to use them – not just during the forthcoming Easter holidays, but for future generations also. Recreational facilities can suffer as a result of invasive species. Fish populations may reduce or change, while invasive plants may restrict navigation through waterways, clog up propellers and add significantly to the management costs of our waterways. AGM agenda, nominations, motions received will be published on the 7th of April 2018 on the Canoeing Ireland website. There will be a number of CPD’s available to all instructors and trainees on the day of the AGM details of which will be published shortly.